When it comes to cookware, you should never decide in haste, even if the options can prove to be overwhelming. Choosing the right pots and pans to use in the kitchen is important as it can have an impact on your cooking experience, and more importantly, on the cooking output. Things like heat conductivity, price, durability, maintenance, and aesthetics, among others, should be given emphasis. Among other materials for cookware, one of the best that can be taken into account is ceramic. While ceramics is a relatively new material in the market for cookware, it did not take long before it gained popularity because of its wide array of benefits, which include being environmentally-friendly and safe. In recent years, advanced technologies have been also introduced, providing ceramic cookware with the ability to offer innovative alternative to conventional materials. Are you on the lookout for the best ceramic cookware that is available in the market today? Stop searching and learn from what we will discuss in the rest of this article. Below, you will learn about some of the essential factors that you will consider to arrive at a well-informed decision. More so, we will also provide recommendations on five of the best brands and models that can be taken into account. Attractive Design: When you first see a cookware made from ceramic, your attention will surely be captivated. When it is placed in the kitchen, for sure, your guests will compliment how nice it is. It is available in a wide array of designs and colors, allowing you to choose which one is best for your kitchen. Long-Lasting: Another reason why ceramic is a preferred material for cookware is its durability. Even through the years, you can still expect it to deliver high level functionality and its appearance will not be easily subjected to wear and tear. This makes it a great investment in the kitchen. ​Versatile: Ceramic cookware can be used in different cooking applications, such as oven, stovetop, microwave, and even on a grill. It is also dishwasher safe and can be placed inside the freezer. In fact, it can even be used for serving food directly on the table as long as the cookware looks attractive. ​Even Heat Distribution: Have you ever cooked any food and you ended up having burnt spots while there are some that are undercooked? To prevent such from happening again, you should consider the use of ceramic cookware, which is known for its ability to distribute heat equally to avoid over or undercooking. ​Safe for your Health: If you are like many people interested in healthy cooking, you have another good reason to choose ceramic cookware. It is free from cadmium, lead, and other toxic chemicals. In addition, it can also cook with the use of lesser oil. Eco-Friendly: Another good thing about ceramic cookware is that it is not only good for your health, but it is also good for the environment. This is basically because it can cook with the use of less energy. Read Feedbacks: Before you make any final decision, one of the first things that you should do is to consult with what other people have to say. There are online reviews and you can ask for suggestions of people you personally know. Through their insights and experiences, it will be easier to differentiate one option from the other. Go Beyond Price: While it may be tempting to choose ceramic cookware that is cheap, this is not a wise thing to do. Even if it is expensive, you should not mind spending for such if you are sure that it is going to be tantamount into having better quality. ​Consider Ease of Cleaning: Generally speaking, ceramic is a cookware material that is easy to clean. Nonetheless, one model will still differ from the other. Pick an option that is effortless to maintain, which means that you do not have to do a lot to retain its quality and functionality in the long run. ​Check Warranty: Different manufacturers will have different policies for their warranty, which will be indicative of how confident they are about the quality of their product. Some products can have a warranty for a year while the best ones are those that comes with a lifetime warranty. 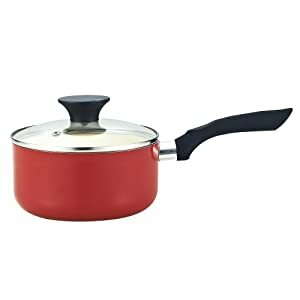 ​Buy Cookware with Lid: As much as possible, especially if you are buying in set, look for cookware with lid. This is going to seal in the moisture and flavor inside the pot and pan, and hence, will not escape. ​Check the Handles: One of the most important parts of ceramic cookware set would be the handle. It is good if it stays cool to avoid injuries. In addition, it should also have an ergonomic design for ease of use. ​Consider Design of your Kitchen: Before you buy ceramic cookware, consider the look that you are trying to achieve. A good starting point would be the appearance of the kitchen, such as its color or the theme. Buy cookware that will complement the look of the kitchen. Find the Right Size and Quantity: If you only have a small kitchen and if you do not cook for a lot of people, settle with smaller cookware or those that do not come in set. On the other hand, if you live with your family and if you cook a lot, look for those that already come bundled. Among other things, one of the best things about this model is the design of its handle as it is ergonomic. Handling the cookware will surely not be effortful on your end. The handles also have anti-slip coating and they also stay cool to the touch, regardless of how long it has been used for cooking. 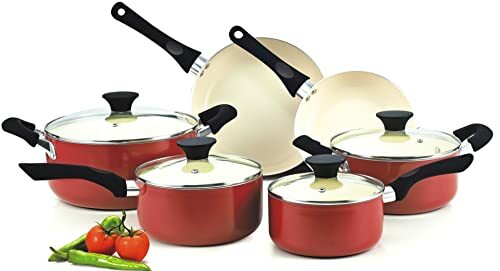 One more thing that we liked about this ceramic cookware is the tempered glass lids some of the pieces have lids that are made from high-quality and long-lasting materials. It allows the flavors to be sealed. More so, it is also a good thing that the lid is transparent, and hence, there is no need to have it removed to monitor progress when cooking. Check Best Price At Amazon.Com! When it comes to aesthetics, you will also not regret choosing this cookware set. 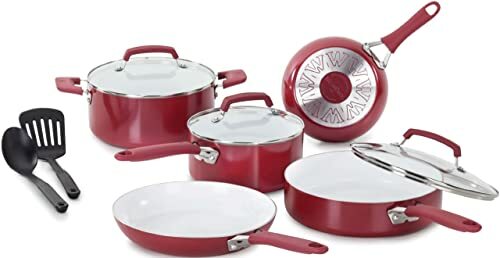 The set comes with red exterior, which is very attractive and will surely make any kitchen look beautiful. Aside from its color, it is also impressive because the paint can resist high temperature. Lastly, we loved how lightweight the cookware is. 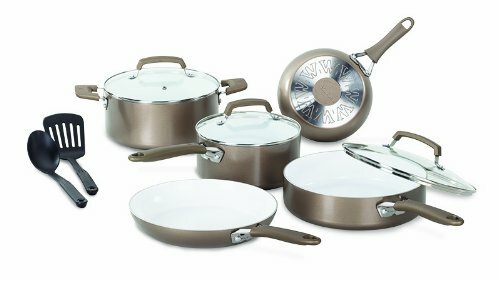 Everything that is included in the set, from the pot to the pans, and even to the lids, they are very light and portable. With this cookware set, you already get to have almost anything that you will need in the kitchen. 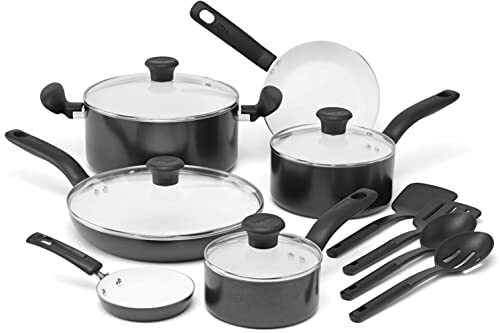 One set is inclusive of 7-inch frypan, 9.5-inch frypan, 1-quart covered saucepan, 2-quart covered saucepan, 5-quart covered casserole, 2.5-quart covered sauté pan, and four utensils made from nylon. It is commendable when it comes to the choice of materials. They are made from lightweight aluminum, which makes it easy to handle. In addition, such material is also known for its heat conduction. It also has stay-cool handle, which is designed with soft grip for easy handling. The Thermolon ceramic coating that is integrated in this cookware set is one more feature that deserves to be given emphasis. It is made in the absence of toxic chemicals and it will not release contaminants when used for cooking. You can be assured of cooking sumptuous and healthy meals all the time. Because of the nonstick coating and being made from ceramic, this cookware set is also easy to clean. You do not have to sweat in cleaning it after use, and hence, making it easy to retain its quality through the years. If you would like to shift to a healthier lifestyle, this is the cookware set that you will need. The set comes complete with fry pans, sauce pans, and skillets, among others. One of the best things about this set is its ability to resist stain and scratches, which means that it will be hard to rival when it comes to durability. More that ceramic coating, it has also been lauded by many because of being built from heavy-gauge aluminum. The latter is excellent not only in terms of durability, but also when it comes to functionality. It allows the cookware to withstand heat of up to 750 degrees Fahrenheit. The ergonomic design of this cookware is another thing that we would like to emphasize. With such, it will be an absolute delight to have it in the kitchen as it will make cooking an easier task. One thing that makes this possible is the silicone handle, which allows users to hold the cookware without the need to exert too much effort. 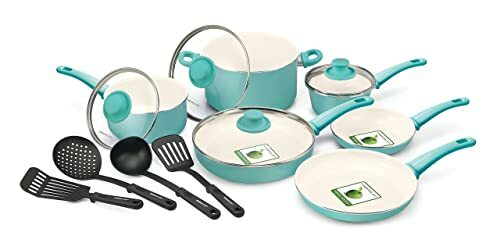 If there is only one reason why you should buy this cookware set, it would be the fact that it is made by T-Fal, which is one of the most trusted names in the market. More than its brand name, this is also preferred by many because it is stain and scratch resistant. Even after several years, it will still function and look as good as new. Its heavy gauge aluminum construction is another reason why this is an option that stands out against the competition. Such material is commendable not only when it comes to durability, but also for its even heat distribution. With its ceramic interior, you can be confident of preparing hearty and heathy meals. It is free from cadmium, PTFE, and PFOA. The latter can release toxic fumes when exposed to heat and are commonly used in other materials for cookware. When it comes to cleaning and maintenance, you have another good reason to believe that this is going to be an exceptional pick. As shared by other users, this cookware set is easy to clean. It is also a good thing that the pieces are dishwasher-safe. Check our detailed review here. This set is inclusive of 5-quart covered Dutch oven, 3.5-quart covered skillet, 3.5-quart covered saucepan, 8-inch sauté pan, 10.5-inch sauté pan, 3-quart covered sauce pan, and two tools made from nylon. The cookware set is designed with your needs in mind. The soft touch, silicone riveted handle is one of its best features. When you hold the pans and lift it, you do not have to exert too much effort as it can be handled in a comfortable manner. Another thing that we liked about this model is its nonstick coating, which is typical for cookware that is made from ceramic. With such coating, you can cook healthier food as lesser oil will be used. If you are looking for cookware that is safe and healthy, this is another option that deserves your attention. It is cadmium and lead-free, which means that it is not going to release toxic fumes even if it is subjected to high heat. Lastly, the manufacturer is also offering Limited Lifetime Warranty. Such extensive warranty coverage will only be extended by manufacturers if they are confident that their product can demonstrate long-term functionality. Check our detailed review here. In sum, while there are many choices that will confront you for the best ceramic cookware, you cannot just choose any model. Being cheap is not a guarantee that it is going to make the best choice. It will be good if you can keep an eye on the five recommendations we have mentioned below, which were also provided excellent feedbacks by their users in the past, guaranteeing their ability to provide the best bang for the buck.